Chef Charles Blakey’s extensive culinary background includes some of Southern California’s finest restaurants: Le Meridien’s Antoine, Lunaria, The Ritz, and Collage. Notably, he served for 3 years as Executive Chef at the critically-acclaimed La Grotte. Charles received his Bachelors of Science Degree in Hotel & Restaurant Management at California Polytechnic University Pomona. He continued his education with Graduation Certificates from The Culinary Institute of America and Ma Maison. 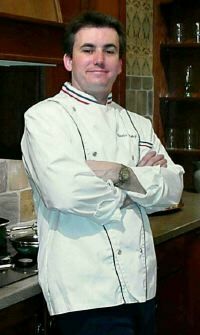 He also has a Safe Food Handler’s Certificate issued by the National Restaurant Association, and is a member of the American Personal Chef’s Association. He has had the privilege to experience the great cuisines of Europe first-hand and credits Chefs Jean Pierre Lemanissier and Andre Angles for inspiration. Yet, after cooking and creating in some of the finest restaurants, Charles insists the greatest influence on his cooking has been his mother.